Looking for Brisbane Cinemas? Brisbane has plethora of options for you. Checkout the complete list of Cinemas in Brisbane below. Event Cinemas are one of the biggest cinema brands in Brisbane. Their cinemas are located at Brisbane City Myer Centre, Carindale, Chermside, Mt Gravatt, Indooroopilly and Moonlight Cinema. An adult ticket starts at $18.50, however, on Tuesdays you will only pay $10.50. Find them in the Myer Centre, Chermside, Garden City, the Hyperdome, Strathpine, Toombul, Browns Plains, Capalaba, Carindale, Indooroopilly and Springfield. You’ll also find the Event-owned Birch Carroll and Coyle in Morayfield. Cineplex is one of the smaller cinema companies in Brisbane and only offers a limited number of movies at a certain time. However, tickets and food are a lot cheaper than your Event Cinemas. An adult ticket starts at $8.50, however, if you attend on a Tuesday or before 6pm on a weekday, you will only pay $6.50. Cinemas are located at Balmoral, Hawthorne, South Bank, Victoria Point and Nerang. South Bank houses the largest screen downtown while Hawthorneboasts a luxurious deluxe cinema and cafe inside a beautiful picture theatre. You can also find Cineplex in Victoria Point, Balmoral and Redbank. Palace Barracks are located in Petrie Terrace and offer a variety of mainstream movies, art house and family films. This is a higher end cinema experience with an espresso bar and café in the cinema. An adult ticket starts at $19.00. Dendy host a variety of films including art house films and often host special events and red carpets. This cinema offers luxury seating and alcohol to customers. 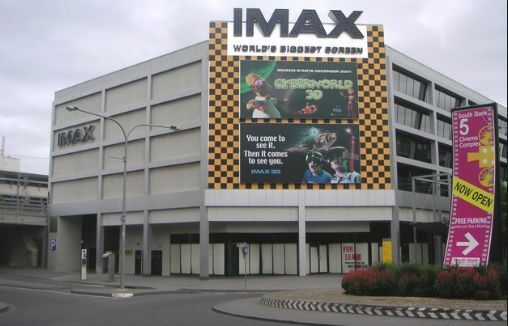 This cinema is located at Portside Wharf and adult prices start at $18.50. The Blue Room offers wine, premium beer, snacks and light meals while you watch your film. This is a great way to see your favourite films in style. Located at Rosalie, adult prices start at $17.50. You can also book a package which include a ticket, meal and drink for $37.50. Watch the movies like they used to, under the stars. Yatala Drive-in offers 4 big movies, starting at $26 for adults. Once inside you will have access to food and drink throughout the whole night. Formerly the Astor Theatre, the New Farm Cinemas are dedicated to giving cinema fans a mix of retro style and state-of-the-art vision and sound. They aim, above all else, to bring the “experience” back to going to the movies and, honestly, we think they’re doing a great job. Grab a beer before the movie and enjoy it in the cinema. The Elizabeth Picture Theatre delivers on the promise of Hollywood glitz and glamour with its Golden Age visage. Step back in time to the hayday of motion pictures in the Tara Room, formerly a ballroom whose roof has been preserved so you can feel that little closer to the stars. Help yourself to a schooner in the cinema and catch a mix of general and limited releases. Back for the 2017/18 Summer Season, the American Express Openair Cinemas invite you to chillax to the max with these outdoor screenings of the latest and greatest. Lie back with a particular someone on a picnic blanket or treat yourself to a touch of comfort with a lounger. This summer, Moonlight Cinema returns to Brisbane on the green beside the Powerhouse. Projecting your favourites onto the big screen, Moonlight lets you relax with a bean bed if you don’t want to nuzzle into the grass and they even offer the Connoisseur Lounge and Gold Grass sections. If it rains, you’re entitled to the same ticket at a new show but tickets are non-refundable. Forget the Hoyts you think you know, each of these venues has been refurbished to replace seats with a spacious recliner. Fewer people around you and more room to get comfortable – the dream. Kick back with popcorn, drinks and even pizza in the cinema for the modern movie-going experience. Find Hoyts in Stafford, Sunnybank and Redcliffe. Also embracing that iconic art deco style, the Blue Room Cinebar knows from experience how to treat yourself at the movies. Paired seating with service during the show mean you can get the Gold Class experience without the Gold Class prices, plus you’re surrounded by beautiful Paddington eateries for before or after. In the heart of the Gallery of Modern Art you’ll find the Cinematheque, where the screens are reserved for the experimental, the historically significant or the just plain weird. If a new Marvel movie just isn’t cutting it, and Liam Neeson’s on-screen explosions leave you feeling nothing, try the Cinematheque instead. Cinemas in the 21st century truly have embraced the charm of reclining to get a better view of the big screen. United El Dorado takes a leaf out of this book with Grand Recliner seating available in all cinemas and Grand Recliners only in cinemas 4 and 7. In tranquil, leafy Graceville you’ll find one of Brisbane’s oldest cinemas, the Regal Twin. This complex houses two cinemas, as you’d imagine, and retains its original 1920s charm. The Regal proudly exhibits the finest European, British, foreign language and Australian films in its drive to be part of Brisbane’s communal, new world culture.